BACKGROUND: To compare the efficacies of standard dose-(SDRT) and escalated dose radiotherapy (EDRT) in newly diagnosed glioblastoma (GBM) with concurrent and adjuvant temozolomide (TMZ). MATERIALS AND METHODS: Outcomes of 126 newly diagnosed GBM patients who received SDRT (60 Gy, 30 fractions) or EDRT (70 Gy, 30 fractions) with concurrent plus adjuvant TMZ were retrospectively analyzed. Both groups received concurrent TMZ (75 mg/m2) during the course of RT and at least one course of adjuvant TMZ (150–200 mg/m2), thereafter. Overall survival (OS) and local progression free survival (LPFS) constituted the primary and secondary endpoints, respectively. RESULTS: At median 14.2 months follow-up, 26 (20.6%) patients were alive. Median LPFS and OS were 9.2 [95% confidence interval (CI); 8.4–10.0] and 15.4 months (95% CI; 12.1–18.8), respectively, for the entire cohort. 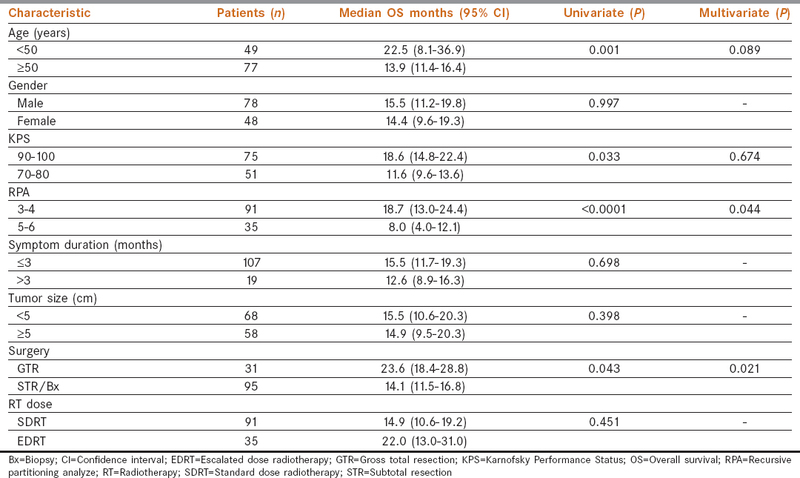 Although the median OS was numerically superior in the EDRT this difference could not reach statistical significance (22.0 vs. 14.9 months; P = 0.45), Likewise, LPFS was also (9.9 vs. 8.9 months; P = 0.89) not different between the two treatment groups. In multivariate analysis, better recursive partitioning analysis class (3–4 vs. 5; P = 0.044) and extensive surgery (gross total resection vs. subtotal resection/biopsy only; P= 0.021) were identified to associate significantly with superior OS times, irrespective of the RT protocol. CONCLUSIONS: Although the current median OS of 22 months of the EDRT group is promising, no statistically significant survival advantage for EDRT was observed even in the presence of TMZ. Randomized studies with larger population sizes and available genetic markers are warranted to conclude more reliably on the fate of EDRT plus TMZ. Glioblastoma (GBM) is the most frequent and fatal primary brain tumor in adults. Previously, prognosis was dismal with estimated individual median and 5-year overall survival (OS) rates of only 10–12 months and nearly 0%, respectively., In this regard, the results of the phase III randomized collaborative trial conducted by the European Organization for Research and Treatment of Cancer (EORTC) and the National Cancer Institute of Canada (NCIC) was encouraging with a 5-year OS rate of 9.7%. This landmark trial demonstrated that the oral administration of temozolomide (TMZ) during and 6 cycles adjuvant to radiotherapy (RT) was associated with significantly enhanced median (14.6 vs. 12.1 months; P < 0.001) and 5-year OS rates (5.51% vs. 1.08%; P < 0.001) compared to conventional 60 Gy RT alone. Since then, the maximal safe resection followed by 60 Gy RT with concurrent (75 mg/m2) and adjuvant 6 cycles of TMZ turned into the current standard of care in newly diagnosed and medically fit GBM patients., However, regardless of the way this estimable study set an imperative framework on GBM treatment, clearly much work is needed to improve the outcomes of such patients even in the TMZ era. Various RT techniques and dose escalations had been used to improve local control and survival times in GBM. [6–11] In the pre-TMZ period many dose escalation studies had been conducted, but failed to demonstrate a remarkable advantage. In the TMZ and highly sophisticated intensity-modulated RT (IMRT) era, studies evaluating the efficacy of escalated dose RT (EDRT) combined with the concurrent and adjuvant TMZ is scarce and limited to investigations concentrating on the organs at risk (OAR) tolerance issues and/or small population sizes including both the anaplastic astrocytomas and GBM together. The novel simultaneous integrated boost (SIB) IMRT methodology is an appropriate RT strategy for the escalation of the dose in the gross tumor volume (GTV), the principal failure site, while keeping the dose to the planning target volume (PTV) in relatively lower limits with no tradeoffs in OAR doses. In previous reports SIB-IMRT was utilized to investigate the plausibility of escalated GTV doses, but neither of them compared their outcomes directly with the standard EORTC-NCIC protocol. Hence, we tried to investigate dose escalation with SIB technique instead of conventional 3-D conformal radiotherapy. Therefore, in absence of such literature we aimed to retrospectively assess whether the escalated SIB-IMRT to the GTV and PTVs in combination with concurrent TMZ was related with higher local control and/or survival rates compared to our retrospective series treated according to standard EORTC-NCIC. The institutional database was retrospectively searched to identify all patients with histologically confirmed GBM, who received conventional or escalated doses of postoperative partial brain RT with concurrent TMZ followed by adjuvant TMZ between January 2007 and January 2014. To be eligible, patients had to meet the following inclusion criteria: age 18–70 years, Karnofsky Performance Status (KPS) ≥70, no prior cranial RT, no prior chemotherapy, available contrast-enhanced pre- and post-operative (pre-treatment) and follow-up magnetic resonance imaging (MRI) scans, available, and adequate hematological, renal, and hepatic functions. The study approved by the institutional review board of our institute before collection of all patient information (Project no: KA 14/37), was conducted according to the principles of the Declaration of Helsinki and the rules of Good Clinical Practice. On the premise of our standard treatment policy in such patients, all patients were first evaluated by a neurosurgeon at the time of diagnosis and underwent surgery with the aim of maximal safe resection or stereotactic biopsy if not relevant due to medical or tumor-related issues. Considering the optimal tissue repair period, the cranial RT was initiated at the end of postoperative 4th and 2nd weeks for gross total resection (GTR)/subtotal resection (STR) and biopsy only patients, respectively. All patients received one of the two treatment protocols utilized in our clinics during this time period [Table 1]. Group 1 patients received the standard Stupp protocol (SDRT) utilizing 3D-CRT between January 2007 and January 2012, while Group 2 patients received EDRT protocol utilizing SIB-IMRT or volumetric arc therapy (VMAT) since January 2012, respectively. Group 2 was created as the consequence of our institutional protocol change that aimed to investigate the impact of EDRT on clinical outcomes of GBM patients in the era of concurrent and adjuvant TMZ and SIB-IMRT, rather than being a part of ongoing prospective study protocol. For each group, the target volumes were delineated by utilizing thin section (2.5–3 mm) co-registered computerized tomography (CT) and MRI scans obtained under treatment conditions after suitable positioning and fixation procedures. Target volume definitions and doses for each were as specified in [Table 1]. Treatment was delivered in 30 fractions in both the SDRT and EDRT groups. In the SDRT group RT was delivered in two separate phases. In the first phase PTV46 received a total of 46 Gy in 23 fractions, which was followed by a cone-down boost phase of boost 14 Gy in 7 fractions for PTV60. In contrast, in the EDRT group all PTV50, PTV60, and PTV70 received the prescribed doses simultaneously in a single phase by utilizing SIB-IMRT technique. For each protocol the biologically equivalent doses (BED) were calculated for respective 10 Gy [BED10= n.d (1 + d/α/β) and 2 Gy (BED2= n.d (1 + d/α/β)], where n, d, and α/β represented the number of treatment fractions, dose per fraction, and constants for tumor response and late effects, individually. Therefore, in the group receiving SIB-IMRT the corresponding EQD2 were 48.6 Gy, 60 Gy, and 73 Gy for the PTV50, PTV60, and PTV70, respectively. All treatments were performed by utilizing high energy linear accelerators: 6 MV, 18 MV, or their combinations if indicated. For quality check, weekly megavoltage cone-beam CTs or portal images were utilized, as appropriate. OAR dose constraints were defined according to the Quantitative Analysis of Normal Tissue Effects in the Clinic (QUANTEC) recommendations. Concurrent chemotherapy consisted of TMZ at a daily dose of 75 mg/m2 on 7 days a week from the first until the last day of RT over 49 days. After a 4-week break, patients received up to 6 cycles of maintenance TMZ (150–200 mg/m2/d) for 5 days every 28 days. Prophylaxis against Pneumocystis jiroveci with trimethoprim-sulfamethoxazole was mandatory during the concurrent RT and TMZ. All patients were examined at weekly intervals, or more frequently if necessitated. Both acute and late toxicity were graded according to the Common Terminology Criteria for Adverse Events (CTCAE) scale, version 3.0, and recorded grade reflected the worst grade observed prospectively. After completing the concurrent RT and TMZ, all eligible patients were examined using gadolinium-enhanced MRI of the brain bimonthly for the first year, every 3 months for the second year, and at 6 monthly intervals, thereafter. In order to prevent potential biases the response assessments were performed by utilizing the same MRI equipment and contrast media between the 2007 and 2012 for all patients. More frequent MRI scanning was allowed in the case of clinical suspicion of disease progression. Functional MRI such as spectroscopy, diffusion, or perfusion was performed in suspicious cases. Tumor response was assessed mainly by utilizing the follow-up MRI scans according to the Macdonald criteria. Primary objective of this retrospective study was to assess the impact of EDRT on the OS outcomes of GBM patients in the era of TMZ. Comparison of the local control rates between the SDRT and EDRT constituted the secondary objectives. OS was defined as the time interval between the initiation of RT and the date of death or last visit. Similarly, local progression free survival (LPFS) was defined as the time interval between the initiation of RT and the first observation of disease progression. A comparison of demographic features between the SDRT and EDRT groups was carried out using the Pearson χ2 test. Survival analysis was performed using the Kaplan–Meier method, and the survival outcomes of subsets were compared with two-sided log-rank tests. For multivariate analysis, the Cox proportional hazard model was used to assess the simultaneous interaction among multiple clinical variables and survival. A two-sided P value ≤ 0.05 was considered significant. The present retrospective database search revealed 157 consecutive newly diagnosed GBM patients treated with SDRT or EDRT plus concurrent and adjuvant TMZ. However, 31 of them were excluded from the analysis because of absence of high quality follow-up brain MRI scans (n = 17) and lost to follow-up (n = 14) reasons. There was no difference in SDRT or EDRT arms according to lost to follow-up or absence of imaging studies. Therefore, the remaining 126 patients formed the study group. Pretreatment patient and disease characteristics were as depicted in [Table 2]. Predominantly patients were male (61.9%), >50 years of age (61.1%), KPS 90–100 (59.5%), recursive partitioning analysis (RPA) 3–4 (59.5%), underwent STR (67.5%), and had the symptom to diagnosis duration of <3 months (84.9%). In general patient demographics was similar between the two groups, however, biopsy was relatively more common in the EDRT than the SDRT group (22.9% vs. 2.2%; P = 0.03). Median follow-up for entire cohort, SDRT and EDRT were 14.2 months, 14.9 months, and 12.6 months, respectively. Median OS was 15.4 months (95% CI; 12.1–18.8) for the entire cohort, and 100 (79.4%) patients were dead at the time of this analysis. Although the median OS was numerically superior in the EDRT than the SDRT group [22.0 (95% CI; 13–31) vs. 14.9 months (95% CI; 10.6–19.2); P = 0.45] this difference could not reach statistical significance [Figure 1]. Respective 1-, 2-, and 3-year OS rates for SDRT vs. EDRT groups were 60% vs. 68.6%, 31.7% vs. 34.6%, and 22.4% vs. 34.6%, respectively. Further analysis revealed that, in absence of distant metastasis and toxic deaths, the local disease progression was the sole cause of death in both groups. Median LPFS for entire cohort was 9.2 months (95% CI; 8.4–10.0) with no noteworthy difference between the SDRT and EDRT groups (9.9 vs. 8.9 months; P = 0.89). Respective 1- and 2-year LPFS rates for SDRT vs. EDRT groups were 67.6% vs. 63.3% and 32.4% vs. 30.0%, respectively. As previously evaluated in the Radiation Therapy Oncology Group (RTOG) 0023, we analyzed prognostic factors related with OS and LPFS. 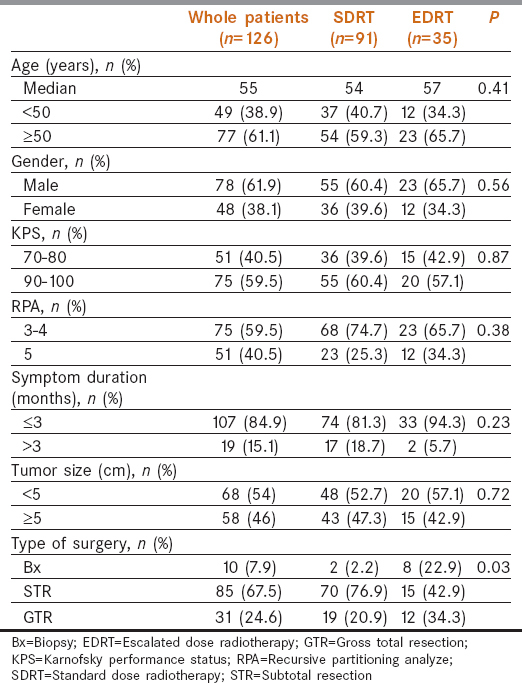 Age (<50 vs. ≥50), gender (male vs. female), KPS (90–100 vs. 70–80), RPA (3–4 vs. 5–6), symptom duration (<3 vs. ≥3 months), tumor size (<5 vs. ≥5 cm), and extent of surgery (GTR vs. STR/Bx) were analyzed. In univariate analysis, age (<50 vs. ≥50; P = 0.001), RPA (3–4 vs. 5; P < 0.0001), KPS (90–100 vs. 70–80; P = 0.033), and extent of surgery (GTR vs. STR/Bx; P = 0.043) appeared to be the factors to associate with superior OS times [Table 3]. However, in multivariate analysis, only the RPA classification (P = 0.044) and the extent of surgery (P = 0.021) could retain their significance on OS times [Figure 2]. In analysis of LPFS none of above-mentioned factors influenced the outcomes in a statistically significant manner. We retrospectively compared the efficacies of the SDRT of 60 Gy and EDRT of 73 Gy administered with concurrent and adjuvant TMZ in newly diagnosed GBM patients. Although the EDRT group has numerically better outcomes, our results indicated no statistically significant superiority of EDRT over SDRT in terms of OS and LPFS endpoints, suggesting no enhancing role for moderate dose escalation even in the setting of TMZ. In good accordance with the available literature, RPA (P < 0.0001) and the extent of surgery (P = 0.043) emerged to be the two independent prognostic factors in such patients regardless of the RT scheme. Before the publication of the results of the benchmark EORTC-NCIC trial 22981-26981, the outcomes of one randomized study and the retrospective review of three Brain Tumor Study Group trials set the postoperative conventionally fractionated 60 Gy as the standard RT dose for newly diagnosed and medically fit patients as the outcomes demonstrated improved OS times with 60 Gy than with <60 Gy., Although these results suggested a dose response relationship, efforts for further dose escalation have failed to demonstrate any notable benefit of EDRT with doses beyond 60 Gy for local tumor control or OS before the implementation of TMZ to GBM.,,,,, In 2005, changing the standard care management of GBM the EORTC-NCIC 22981-26981 trial exhibited that the TMZ administration concurrent with and adjuvant to the standard 60 Gy RT significantly improved the OS times., Indicating the clear need for further investigations with the aim to improve local control rates, the progression-free survival rate of only 11% observed in this study showed that the local failures remained the main cause of deaths in GBM patients despite addition of the TMZ to the therapy. Albeit great effort has been spent on the EDRT in the pre-TMZ era, these reports might not reflect the potential superiority of EDRT over SDRT with concurrent TMZ administration. Unfortunately, comparative EDRT studies involving TMZ are scarce and are usually heterogeneous regarding the RT schemes and patient selection criteria issues.,,,, To our knowledge, to date, no randomized trial directly compared the SDRT with EDRT in presence of TMZ. NRG oncology group is currently conducting a randomized phase II trial of hypofractionated dose-escalated IMRT or proton therapy vs. conventional photon RT with TMZ in newly diagnosed glioblastoma named NRG BN001 (ClinicalTrials.gov NTC02179086). Excluding the one by Badiyan et al., available studies focused on hypofractionated conformal RT and/or stereotactic radiosurgery boost to residual tumor mass.,, In Badiyan's retrospective study the RT dose was moderately escalated with a median EQD2 of 64 Gy (range: 61–76 Gy) which is notably lower than our EQD2 of 73 Gy. However this study differs from our study not only for usage of heterogenous RT doses in the EDRT group (range: 61–76 Gy vs. 73 Gy) but also inclusion of patients with relatively poorer performance status (KPS = 60) as well, additional use of gliadel wafers in 10.9% patients, and use of maintenance TMZ in only 79.4% compared to our 100%. These disparities are vital for highlighting the challenges in comparing outcomes of studies even if their designs are similar. Despite the disparities between the two studies an important and common finding of Badiyan's study and the one presented here is that both studies failed to demonstrate a favorable role for EDRT over the conventional 60 Gy even in presence of concurrent TMZ. The 2-year OS rates (36.0% vs. 34.6%) for EDRT groups were almost identical in Badiyan's and our studies, respectively. Similarly, both studies could not exhibit an enhancing role for EDRT with respect to the local tumor control rates, at least at the median dose ranges of 64–73 Gy EQD2 utilized by Badiyan et al. and our group. The results of these two retrospective reviews make it questionable whether this EDRT dose range is ineffective for accomplishing better tumor control- and resultant OS rates. In this respect some studies in the absence of TMZ have delivered up to 90 Gy to the GTV with various techniques including the hypofractionated RT, brachytherapy, and stereotactic radiosurgery.,,,, However, unfortunately, such aggressive EDRT maneuvers also failed to enhance outcomes beyond the conventional 60 Gy. These outcomes may reasonably be associated with at least two causes: first the frequent extension of the GBM beyond the visible GTV on MRI where it is difficult to escalate RT dose because of significant toxicity concerns. And second, GBM's well-recognized radioresistance because of its high mitotic rate, hypoxic environment, and accelerated repopulation observed during the later phase of a 6-weeks RT course.,, Although it needs to be confirmed by clinical studies, keeping in mind these facts, it is rational to suggest that shorter courses of RT in presence of effective chemotherapeutics and probably hypoxic radiosensitizers in conjunction to EDRT with adequate normal tissue sparing methodology may be beneficial in improvement of poor outcomes. In accordance with the available literature, GTR and RPA scores 3–4 were identified as the independent prognostic factors associated with improved outcomes. In the phase II RTOG 0023 study Cardinale et al. assessed the feasibility, toxicity, and efficacy of dose-intense accelerated RT using weekly fractionated stereotactic RT boost for GBM patients. Although the authors reported a trend for better median OS in patients with GTR and EDRT than the similar historic group treated with SDRT (16.6 vs. 12.0 months; P: 0.14) this difference did not reach statistical significance. Similarly we could not demonstrate any EDRT subgroup with significantly superior results than their SDRT counter parts: GTR (P: 0.29), age <50 years (P: 0.58), KPS 80–100 (P: 0.59), RPA 3–4 (P: 0.74), and tumor size <5 cm (P: 0.91). However, neither the outcomes of the RTOG 0023 trial and the one exhibited here ought to be acknowledged as indisputable with respect to their retrospective comparison nature and relatively limited population sizes for more conclusive subgroup analysis. Although our study is important as it compared the outcomes of SDRT and EDRT between two relatively homogenous patients groups who were treated with the same treatment protocol in the era of TMZ, yet it has some certain limitations:First, its single center, non-randomized, and retrospective design have the potential for unpredictably biased results. Second, a population size of 126 patients might still be too small to detect any moderate but significant improvement in outcomes. Also, toxicity rates of SDRT and EDRT could not be assessed. And third, lack of methyl guanine-DNA methyl transferase (MGMT) mutation status and isocitrate dehydrogenase 1 and 2 (IDH-1 and IDH-2) renders it impossible to identify presence of a potential EDRT subpopulation which may have benefited better from EDRT and TMZ combination. Additionally, salvage therapies may have changed pre- and post-2012 for SDRT and EDRT population, respectively. 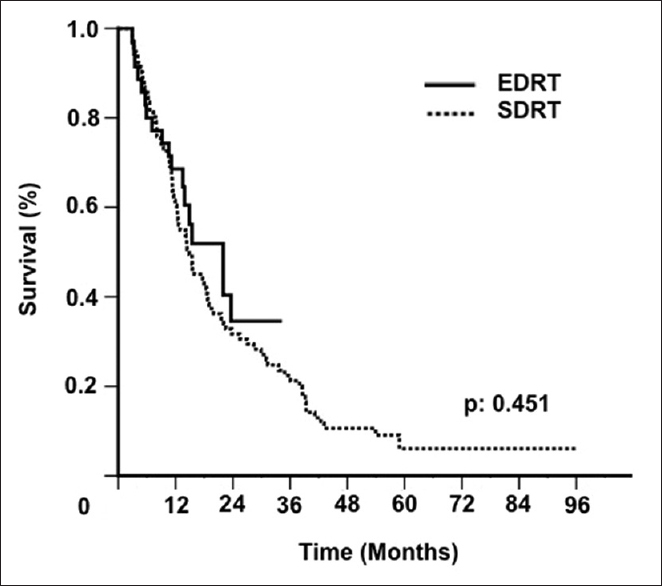 Although the median OS of 22 months observed in the EDRT group herein is promising, we could not demonstrate any statistically significant survival advantage for EDRT over SDRT even in the presence of TMZ. Results of this retrospective study should be interpreted carefully. Outcomes of randomized studies addressing the same question with larger population sizes and available genetic markers should be waited to conclude more reliably data on this subject of paramount importance. Bruner JM. Neuropathology of malignant gliomas. Semin Oncol 1994;21:126-38. Weller M, van den Bent M, Hopkins K, Tonn JC, Stupp R, Falini A, et al. EANO guideline for the diagnosis and treatment of anaplastic gliomas and glioblastoma. Lancet Oncol 2014;15:e395-403. Chan JL, Lee SW, Fraass BA, Normolle DP, Greenberg HS, Junck LR, et al. Survival and failure patterns of high-grade gliomas after three-dimensional conformal radiotherapy. J Clin Oncol 2002;20:1635-42. Chang CH, Horton J, Schoenfeld D, Salazer O, Perez-Tamayo R, Kramer S, et al. Comparison of postoperative radiotherapy and combined postoperative radiotherapy and chemotherapy in the multidisciplinary management of malignant gliomas. A joint radiation therapy oncology group and Eastern Cooperative Oncology Group Study. Cancer 1983;52:997-1007. Laperriere NJ, Leung PM, McKenzie S, Milosevic M, Wong S, Glen J, et al. Randomized study of brachytherapy in the initial management of patients with malignant astrocytoma. Int J Radiat Oncol Biol Phys 1998;41:1005-11. Monjazeb AM, Ayala D, Jensen C, Case LD, Bourland JD, Ellis TL, et al. Aphase I dose escalation study of hypofractionated IMRT field-in-field boost for newly diagnosed glioblastoma multiforme. Int J Radiat Oncol Biol Phys 2012;82:743-8. Selker RG, Shapiro WR, Burger P, Blackwood MS, Arena VC, Gilder JC, et al. The brain tumor cooperative group NIH trial 87-01: A randomized comparison of surgery, external radiotherapy, and carmustine versus surgery, interstitial radiotherapy boost, external radiation therapy, and carmustine. Neurosurgery 2002;51:343-55. Souhami L, Seiferheld W, Brachman D, Podgorsak EB, Werner-Wasik M, Lustig R, et al. Randomized comparison of stereotactic radiosurgery followed by conventional radiotherapy with carmustine to conventional radiotherapy with carmustine for patients with glioblastoma multiforme: Report of Radiation Therapy Oncology Group 93-05 protocol. Int J Radiat Oncol Biol Phys 2004;60:853-60. Truc G, Bernier V, Mirjolet C, Dalban C, Mazoyer F, Bonnetain F, et al. Aphase I dose escalation study using simultaneous integrated-boost IMRT with temozolomide in patients with unifocal glioblastoma. Cancer Radiother 2016;20:193-8. Cho KH, Kim JY, Lee SH, Yoo H, Shin SH, Moon SH, et al. Simultaneous integrated boost intensity-modulated radiotherapy in patients with high-grade gliomas. Int J Radiat Oncol Biol Phys 2010;78:390-7. Macdonald DR, Cascino TL, Schold SC Jr., Cairncross JG. Response criteria for phase II studies of supratentorial malignant glioma. J Clin Oncol 1990;8:1277-80. Bleehen NM, Stenning SP. A medical research council trial of two radiotherapy doses in the treatment of grades 3 and 4 astrocytoma. The medical research council brain tumour working party. Br J Cancer 1991;64:769-74. Walker MD, Strike TA, Sheline GE. An analysis of dose-effect relationship in the radiotherapy of malignant gliomas. Int J Radiat Oncol Biol Phys 1979;5:1725-31. Cardinale R, Won M, Choucair A, Gillin M, Chakravarti A, Schultz C, et al. Aphase II trial of accelerated radiotherapy using weekly stereotactic conformal boost for supratentorial glioblastoma multiforme: RTOG 0023. Int J Radiat Oncol Biol Phys 2006;65:1422-8. Jastaniyah N, Murtha A, Pervez N, Le D, Roa W, Patel S, et al. Phase I study of hypofractionated intensity modulated radiation therapy with concurrent and adjuvant temozolomide in patients with glioblastoma multiforme. Radiat Oncol 2013;8:38. Massaccesi M, Ferro M, Cilla S, Balducci M, Deodato F, Macchia G, et al. Accelerated intensity-modulated radiotherapy plus temozolomide in patients with glioblastoma: A phase I dose-escalation study (ISIDE-BT-1). Int J Clin Oncol 2013;18:784-91. Nieder C, Mehta MP. Advances in translational research provide a rationale for clinical re-evaluation of high-dose radiotherapy for glioblastoma. Med Hypotheses 2011;76:410-3. Badiyan SN, Markovina S, Simpson JR, Robinson CG, DeWees T, Tran DD, et al. Radiation therapy dose escalation for glioblastoma multiforme in the era of temozolomide. Int J Radiat Oncol Biol Phys 2014;90:877-85. Floyd NS, Woo SY, Teh BS, Prado C, Mai WY, Trask T, et al. Hypofractionated intensity-modulated radiotherapy for primary glioblastoma multiforme. Int J Radiat Oncol Biol Phys 2004;58:721-6. Halperin EC, Bentel G, Heinz ER, Burger PC. Radiation therapy treatment planning in supratentorial glioblastoma multiforme: An analysis based on post mortem topographic anatomy with CT correlations. Int J Radiat Oncol Biol Phys 1989;17:1347-50. Budach W, Gioioso D, Taghian A, Stuschke M, Suit HD. Repopulation capacity during fractionated irradiation of squamous cell carcinomas and glioblastomas in vitro. Int J Radiat Oncol Biol Phys 1997;39:743-50. Schmidt-Ullrich RK, Contessa JN, Dent P, Mikkelsen RB, Valerie K, Reardon DB, et al. Molecular mechanisms of radiation-induced accelerated repopulation. Radiat Oncol Investig 1999;7:321-30. Withers HR, Taylor JM, Maciejewski B. The hazard of accelerated tumor clonogen repopulation during radiotherapy. Acta Oncol 1988;27:131-46.